Once upon a time, the United States Postal Service enjoyed a successful relationship with the nation’s railroads. 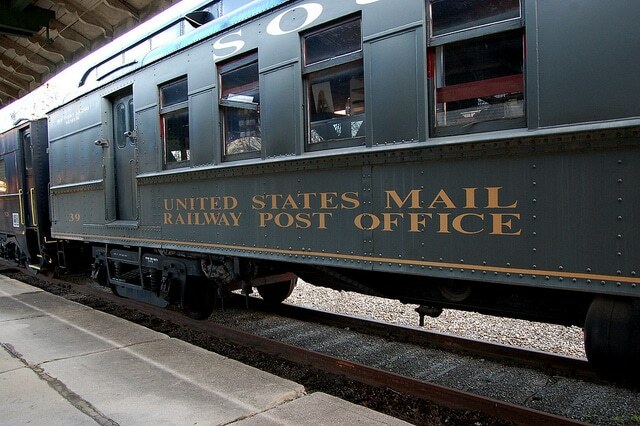 The California State Railroad Museum Foundation reminds us of the once-speeding postal trains, rather than today’s trucks, where post office workers sorted letters during the trip. Moreover, they did so in “swaying cars filled with canvas bags and wooden pigeon holes.” That must have been fun. Perhaps a change back to rail and train is once again a practical venture. Reasons to encourage rail integration were laid out in a recent report by the Postal Service’s Inspector General. Bill McAllister for Stamp News and Coin World recently wrote on the new report, Suitability of Rail Transportation — New Jersey Network Distribution Center, and a dialog that followed. Due to the managerial opposition, it will be a while before any transition to trains that service postal loads. However, they did agree to consider the recommendations. In spite of opposition, a convincing conversation might generate adaptation back to rail for some postal services. Last year, the rail industry did enjoy a resurgence as a Wall Street Journal video and Betsy Morris reported on America’s New Railroad Age. via USPS OIG: Suitability of Rail Transportation Suggest It Is Time To Use Rail Once Again | CleanTechnica. This entry was posted in Downsizing USPS, Motor Vehicle Service and tagged freight trains, HCRs, postal trains, Rail Transportation, UPS, USPS OIG. Bookmark the permalink. When has USPS ever worried about service standards? ?